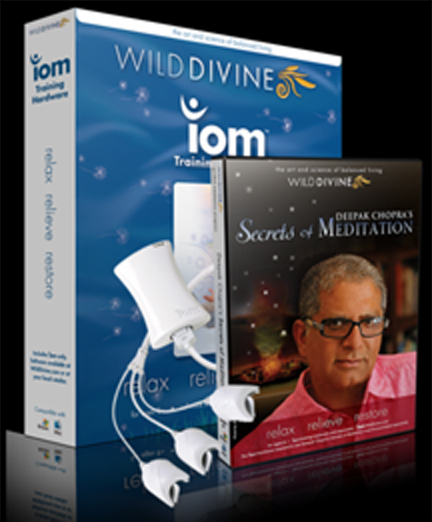 Deepak Chopra: Secrets of Meditation Software With IOM. Deepak Chopra's Secrets of Meditation is a BRAND NEW, one-of-a-kind meditation experience led by Dr. Deepak Chopra and our Iom hardware. With Deepak Chopra's Secrets of Meditation, you’ll embark on a soothing journey into a visually immersive, rich world where you’ll unlock the secrets of a deeper, more fulfilling meditation practice. You will tap into levels of the unconscious, previously attainable only after years of study. The active feedback of the Iom lets you get into deeper meditative states, faster than ever before possible. The Secrets of Meditation will transform both your meditation, and your day-to-day life. With Deepak Chopra's Secrets of Meditation, you’ll experience your life in an entirely new way. If you're new to meditation, this is the fastest method to the benefits of meditation, without folding yourself up like a lawn chair or spending months or years wondering "Am I doing it right?" With Dr. Chopra's guidance and the immediate, active feedback of the Iom, you'll know within 15 minutes that you're doing it right. And when you have the confidence you're doing it right, it becomes much, much easier to take it to the next level, where the really dramatic breakthroughs start to manifest themselves in your life. Challenge yourself. Each of the Active Feedback challenges in Secrets of Meditation has adjustable difficulty settings, from 1 to 100. This provides endless replayability and a highly effective method of testing various schools of meditative thought and practice. Get started with Deepak Chopra's Secrets of Meditation today, and start enjoying the amazing benefits quicker than ever before possible!